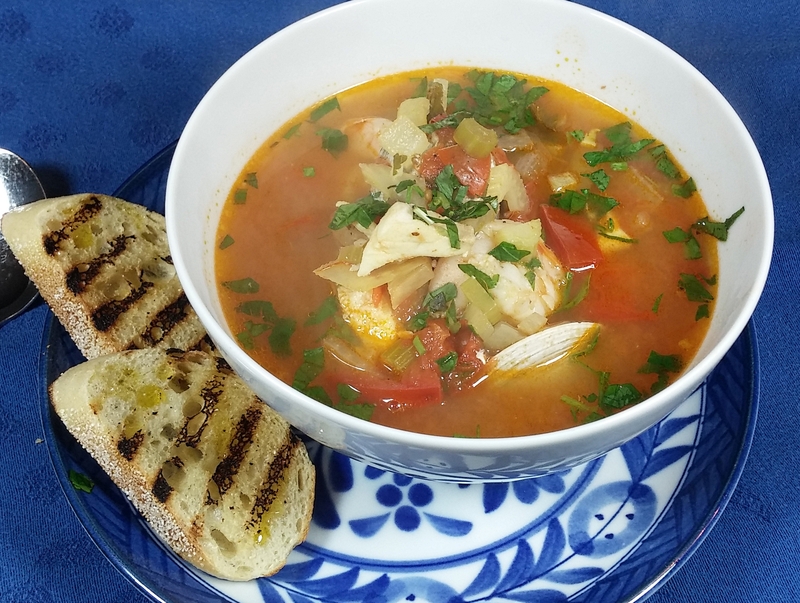 A delicious seafood stew with traditional Provencal flavorings. This is a small batch since I don't like this as a leftover, but it can be easily doubled or tripled for a larger group. 1/2 small fennel bulb thinly sliced. 1/2 small yellow onion thinly sliced. 4 oz halibut cod or other firm white fish, cut into 2" cubes. Place saffron in wine and set aside to allow the saffron to "bloom" and infuse wine. Heat olive oil to medium heat in a dutch oven or soup pot. Add fennel, onion, celery and garlic and cook for ~5 minutes until vegetables are softened. Add tomato paste and cook for another 1-2 minutes. Add tomatoes, bay, thyme, and broth and bring to a boil. While soup is coming to a boil, prepare bread. Grill bread on a hot grill pan or toast. Rub grilled bread with cut garlic clove and drizzle with olive oil. Once soup is boiling, reduce heat to medium low and add clams. After 3 minutes, add halibut pieces and cook for another 3 minutes. Add shrimp and cook for another 3 minutes. Remove soup from heat and stir in half the parsley and tarragon. Serve immediately garnished with remaining herbs and and with grilled bread on the side.